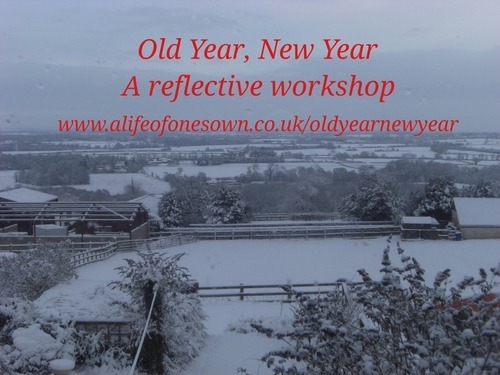 Old Year, New Year is a reflective workshop that will do to your soul what a hearty meal and a bracing walk do to your body: nourish and invigorate. Skip forward a couple of weeks. Imagine we’re in the hinterland of the year, those shapeless days when Christmas has passed but we haven’t quite made it to the fresh start of the new year yet. What will it be today? A late start after staying up past your usual bedtime doing nothing in particular (notwithstanding your resolve that this would be the year when you didn’t get into a habit of lie-ins as it makes you feel groggy)? Leftover turkey, pork pie and half a tin of Cadbury’s Roses chocolates (and that’s just for breakfast)? Festive TV repeats or a trudge around the sales (despite vowing not to buy anything else because you’re not sure what the next credit card bill will look like)? Kids happily playing with their new toys – or has too much sugar and too little sleep ruined everyone’s mood (including yours)? Inertia and inability to do anything much, in spite of cabin fever so bad that any form of escape seems appealing (and even the return to work is beginning to look attractive)? You know those feelings, right? Those phantom days hold so much promise, so much potential, but too often simply flash by leaving us with an indefinable sense that something should have been different; somehow we could have gotten more out of our time. Now imagine that moment again. Only this time you’re entering a warm, comfortable room. There’s a log fire roaring and old books line the walls. You choose your seat, either curling up on an old leather sofa or drawing a chair up to a little bistro table. You settle back into your seat, knowing an afternoon tea made up of delicate sandwiches and cream cakes will be coming your way soon. Around you is a small group of other women, a sense of camaraderie, but essentially the next few hours are yours and yours alone – a precious opportunity to look back on the year that’s drawing to a close and ahead to the one fast approaching. This is Old Year, New Year. Old Year, New Year is all about exploring our lives over the past year and into the coming year, with a break for afternoon tea between the two. Your time at the workshop is like hitting a pause button for a few hours, giving you the time and space to remember, reflect and recharge. You will receive prompts to aide your reflection, with a structured process to guide and support you. Old Year, New Year involves delving into our memories of 2014, both celebrating the highs and acknowledging the lows. We will individually consider what we’ve appreciated and any regrets or wistfulness we may have. There will also be an exercise to mark the passing of the year, a chance to let go of whatever it is we may prefer to leave behind. After afternoon tea to refresh us on this soulful journey, we will turn to face 2015. Recognizing the sense of transition that the move from December to January brings, we will look to embrace the fresh start offered to us. There will be no short-lived hackneyed resolutions in this workshop! Instead our time together is about getting really clear about our plans, hopes and aspirations for the twelve months’ ahead – and how to take the first steps to realizing those dreams. We will tread the magical line between being completely intentional and yet totally open to any possibilities that may come our way, because this path is where the good stuff happens! Sound appealing? Then get yourself signed up! Places are limited because of the room size and the level of support I want to provide. And if time or geography prevents you from attending in person, you can still take part remotely…keep reading for details. The Old Year, New Year workshop is taking place on Tuesday 30th December, with registration from 1.15 to 1.30 and the workshop itself from 1.30pm to 4.30pm. It is being held in The Library of the Red Lion Hotel, a C16th coaching inn in Atherstone, north Warwickshire, England. (details provided upon registration, including information about free parking at the venue). The cost is £20 per person, which includes an afternoon tea of sandwiches, cakes and a hot drink. The deadline for booking is midnight on Sunday 21st December. For more information, including some common questions, check out the Old Year, New Year webpage.